Simply hang it onto the wall, it will make your room and your world amazing. The pattern has been printed on the cloth, so before finishing stitching, the cloth cannot touch water, otherwise the printed part will disappear. 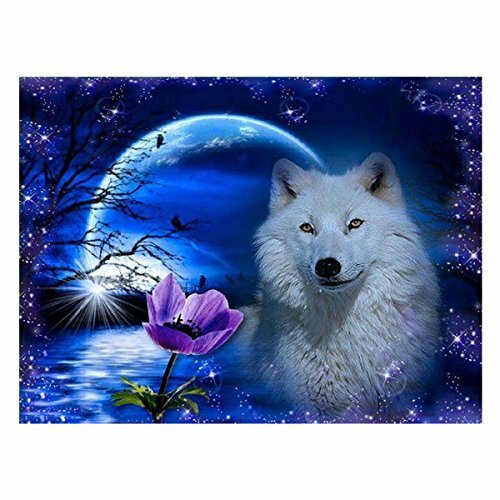 PREFECT WALL DECOR: High clear rhinestone painting canvas with waterproof texture, color printing, environmental canvas, high definition pattern, good texture and aesthetic will be never fade making your room more vivifying and Shining in the light. ADD FUN TO LIFE: Finishing a DIY diamond painting is a lasting but funny process, during this process, you can learn to reduce stress, emotional adjustment, enhance self-confidence and perseverance, cultivate patience and finally experience proud and successful. GOOD FOR GROUP WORK: Finishing DIY rhinestone embroidery cross stitch is a big project, so that you can drawing with family and friends snuggling up together or work with them to enjoy the joy of family and friends, improve and consolidate relationships. LONG-TERM PRESERVATION: Finished project can be kept for more than 20 years. Perfect to decorate your living room or bedroom. And we provide 48-day money-back and 6-month warranty. So feel free to contact us if you have any question. DIY PRODUCTION STEPS: Firstly place the same diamonds in tray, then take the "pen" insert to the square adhesive lightly, leave some adhesive on the pen, finally pick up the diamond and place it on the corresponding number on the canvas.